where #1 contains the link to the data page and #3 is the login page, respectively. So, eager to get an oca logo for free, saving the exam efforts? Hell-bent on breaking the rules as set forth in http://www.oracle.com/education/downloads/ocplogoguidelines.pdf? Ok, watch out for this page and click as depicted. ps. The how to works the same for ocp logos (i did’nt test the ocm part as well). 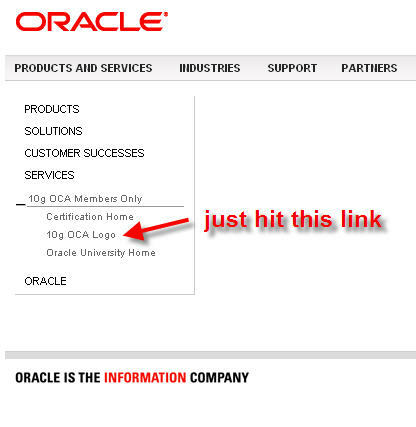 Just use http://www.oracle.com/education/10gocp. Hey oracle, you built the best database ever. What about securing your web contents appropriately?